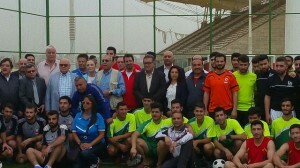 On Sunday April 10, 2016, on the occasion of the 65th anniversary of the founding of the Lebanese University (LU), the “Saida Stadium for All” a USAID-funded project implemented by Caritas Lebanon hosted a sports day, organized by the LU Sports Activity department in cooperation with the Municipality of Saida. The sport activity included a mini-football and basketball tournaments. More than 85 university students and technical staffs participated in the tournament representing three Lebanese University faculties, the Faculty of Institute of Technology, the Faculty of Science and the Faculty of Law. 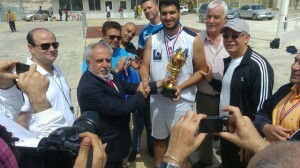 A total of five football and two basketball tournaments took place during the event. The project aims to induce sport as an important activity within the lives of children and youth by providing a safe and healthy place to practice sports. It will also enable communities from different backgrounds to interact and establishing inter-group harmony. Most importantly, the project will support the local economic development of the area by creating job opportunities and improving public services through the municipality of Saida.